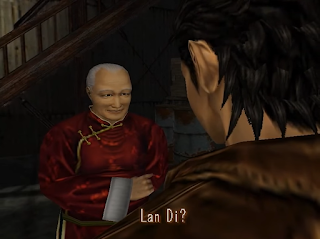 In the English version of Shenmue, Lan Di is described as being the leader of the Chi You Men, a significant fact about one of the key characters in the story. 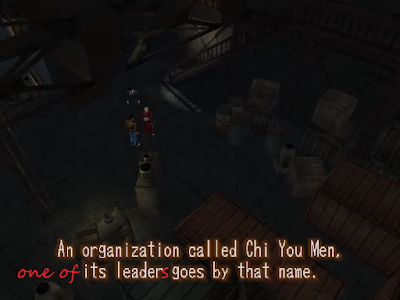 This information is provided by the trustworthy Master Chen, whom Ryo visits in an early part of the game. However unfortunately it turns out that while Master Chen may be trustworthy, the English translation is not perfectly faithful to his original words. Have these words been put into Master Chen's mouth? 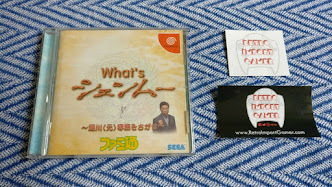 Let's examine the Japanese version to find out if this is exactly what was said. 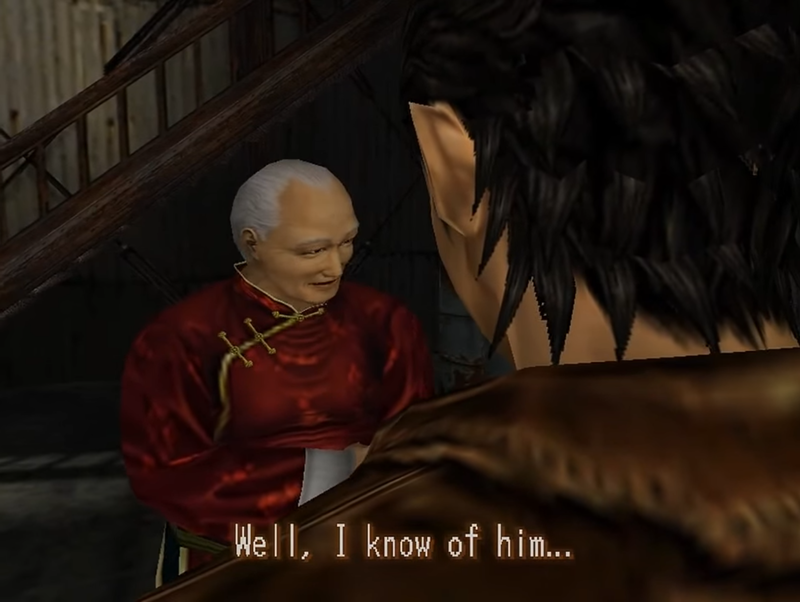 Ryo's first actions at the start of Shenmue are to try to find out information about the man who struck down and killed his father in front of him. Soon after his father's murder, a letter arrives at the Hazuki residence, addressed to Iwao Hazuki. Since the letter is written in obfuscated Chinese characters, Ryo obtains help in deciphering the message which leads to him travelling to New Yokosuka Harbor in Amihama to locate Warehouse No. 8. After sneaking into the warehouse after dark, he comes face to face with Master Chen. Ryo explains the reason for his sudden visit, and learns that the letter he holds was written by a man called Yuanda Zhu. The letter was a late warning to his father that an attempt may be made to seize a mirror that his father and Yuanda Zhu once brought back from China. 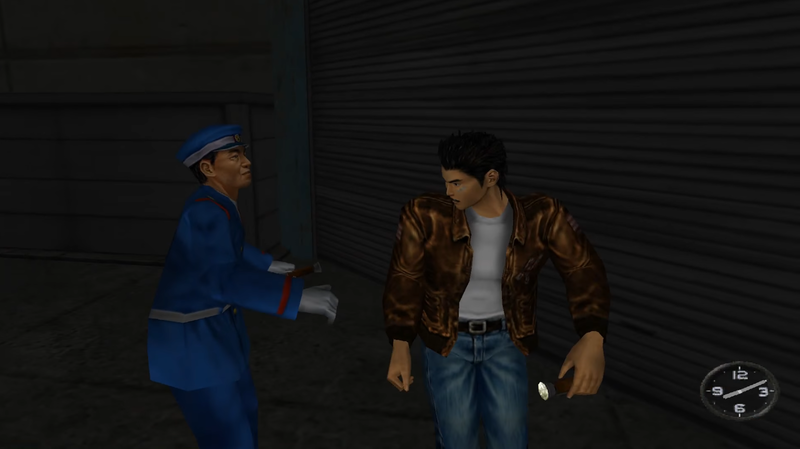 Ryo sees a connection and wonders if it was the one that was recently stolen. Master Chen reacts on hearing the name of the man who took it. Ryo: Yes, [by] the man who killed my father: Lan Di. 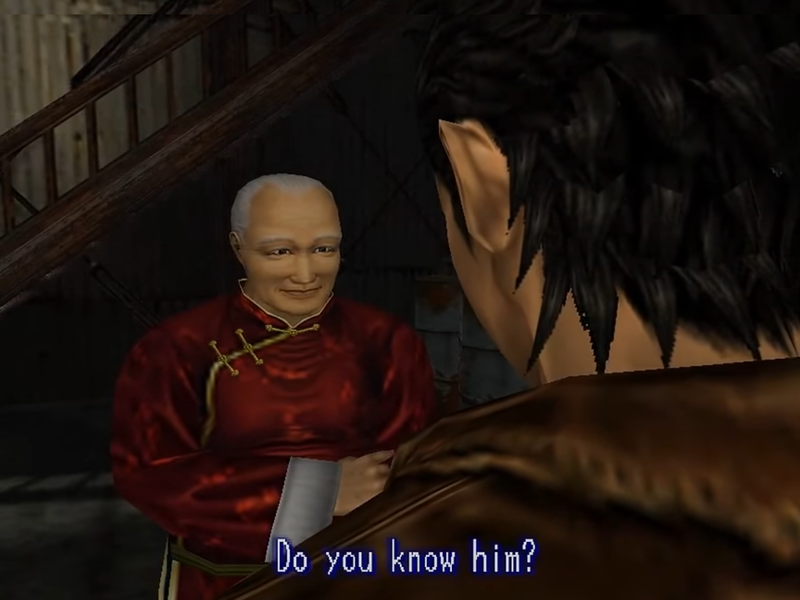 Ryo: Do you know him? Master Chen: An organization called Chi You Men, its leader goes by that name. Note the phrase in italics, indicating that Lan Di holds the topmost position in the organization. 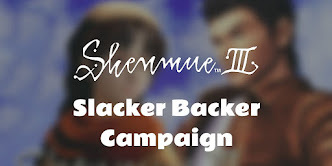 Next, let's compare this with the corresponding line in the Japanese-language version of the game. In the Japanese version, the relevant line spoken by Master Chen is "Shiyoumon to iu soshiki no kanbu de, sono youna na no otoko ga iru to..."
The pertinent element is the use of the word "kanbu", meaning a group of leaders or management, rather than pointing at a single leader. His use of certain words also expresses that his information is second-hand: the word "to" at the end (="I heard that...") and "sono youna na" ("a name like that"). "I heard there's a man with a name like that among the leaders of an organization called Chi You Men". 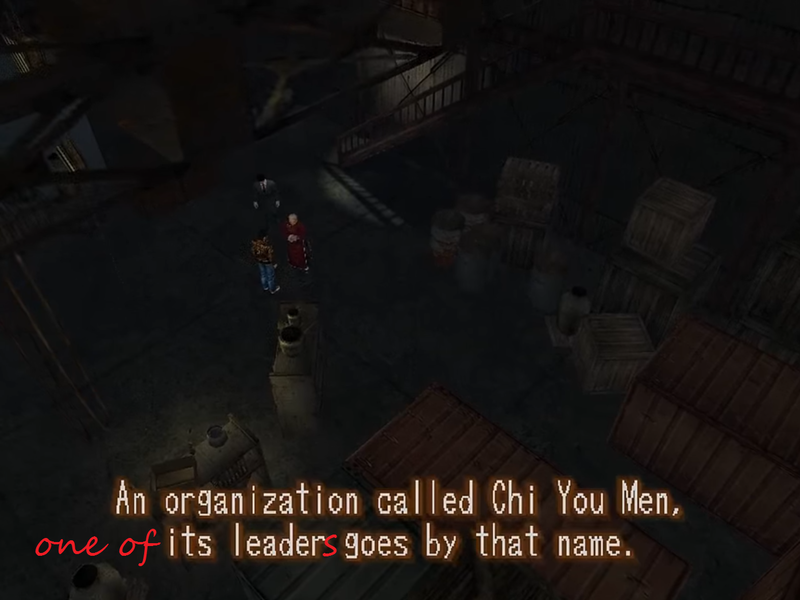 Only a small change to the official translation would have been needed to correct the main error: if the words "one of its leaders" had been used instead of "its leader". There, that clears up any misunderstanding. 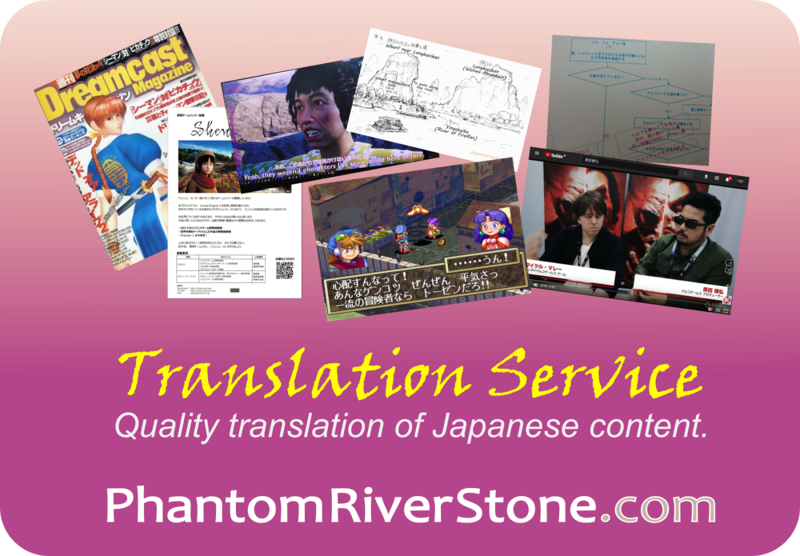 Without such a modification, players of the English version are presented with a different statement about Lan Di's position in the organization. Leave a comment below if you know of any other discrepancies, or to suggest any other conversations whose accuracy you'd like to double-check. It would be nice to straighten out any meaningful differences ahead of the third game of the series! While you are right (as it's well known to happen alot) that the translation may be off,i always felt that he was mentioning the fact that Chi You is the leader, as in the mythological entity/being. Hi Mario, that's an interesting theory although I'm not sure I can find any evidence to indicate it from the Japanese wording. But hopefully we will learn more about the Chi You Men and the leadership in the third game of the series. And Chi You may be human, just like Lan Di represents the Dragon. Him being the Dragon as a title, since Lan Di is not his real name. Ziming Hong will probably have a different name too.